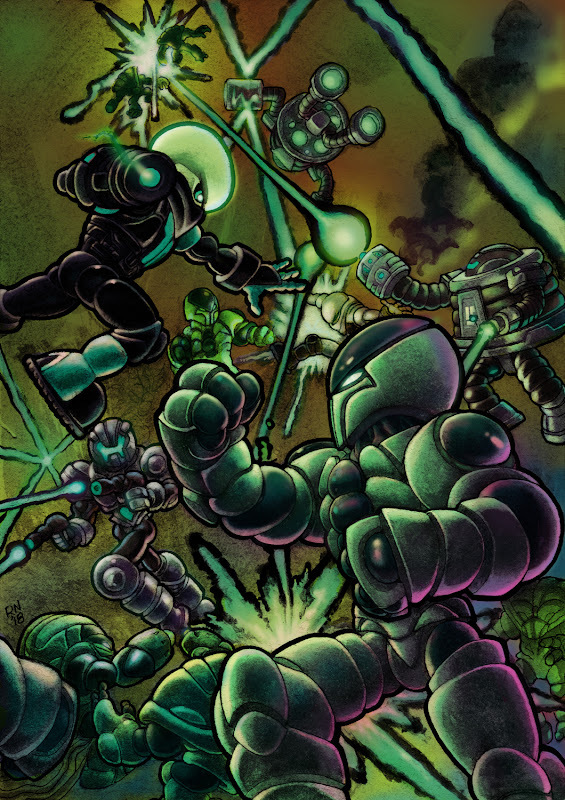 Glyos Transmission Web Log: Wave 74 is GO! Huge thanks go out to Ralph for creating two brand new illustrations to commemorate our 11th anniversary and the launch of the Mechabon/Zetonian! Incredible as always, Ralph! Again, would be awesome as a print! And I'm still curious about what all these extras parts on the Mechabon will be . . . what are the odds we'll catch a sneak peek once things start shipping out? Ralph's work is always top notch but the imagery is really getting me this time around. Well, I tried to help out others by only buying one. But yeah, that was kind of scary. @Matt & co... Congrats on 11 strong years!! Same here. Is this a glitch? I mean, I can’t get into the live store any quicker than the second it goes live. No glitch, it was there at 9:30 eastern, it just sold out really fast. I have no way to prove this, unless Matt replies to this, but I suspect they may have not made very many in case it wasn't well received. Or it was just that it was received as though free money was being dropped from above. I assume you are referring to the Mechabon. Fantastic drop for the anniversary. Really looking forward to seeing the secrets of the Mechabon, especially with the total part count being a mystery, hoping it has something to do with those specific colors... Sadly I'll be out of town most of next week so it's likely I won't be here when my order arrives. Oh hey, just noticed the Villser wasn't in the Featured list when I made my order, had to double dip and ended up spending way more than planned... such is the anniversary drops! Epic. Amazing. Game-changing. Bravo! Happy 11th anniversary! Well-worth staying up past my nite-nite time for!! Steamboat willie in this drop! Can’t unsee! I feel you. I leave for work at 2 a.m. most days. Luckily my oldest woke me up. Happy 11th anniversary Onell. You guys are great, if I had the money I would personally support the whole effort to make sure you can continue making great toys like these. As it is I have to advance spend my Christmas money just to make sure I can get the new figures at during the anniversary the last few years, but it’s worth it!!! Mechanic looks awesome. I know I don’t order much anymore but I’m always here checking the blog every day even when there is no frolic in sight. You guys are great!!! Darn auto correct on my phone, I couldn’t find a way to edit my other post but oh well, you know what I was trying to say. LOL!! I love you guys and the whole community built around it. Is this the same Acro Pheyden from the OTF boards years ago? If so, how have you been! I have not touched base with you in a dog's age! Just saw this comment, yeah it’s me, the one and only. I’m still here and never left, just more lurking and less posting. Hope you are doing well. We miss your old photo comics, I still wonder what finally happened to those alien mercenaries. LOL. Photo comics? You mean like pictures with quotes and captions attached? I thought of doing something like that once. Where could I find these, if they still exist? Great to see you still around man! Doing good, got married, have a 3 yr old little boy now and started getting resin castings of my sculpts made again. Funny you mention the Mercenaries, I started missing them too and actually just brought them back last month. Check out www.bahglenncreations.com and click the Alien Mercenaries section to see 4 new episodes, some specials & a Lost Episode from Season 2! Let me know what you guys think! I just read season one, episode one, and it was pretty good. I'm not sure about the font, though. What did you use to build their ship? And, assuming they're on earth, congrats on using Sol to refer to The Sun. Lots of folk don't do that, so it was a welcome break. I think the font for the narrator is Emblem, but each character talks with a different font. Episode 1 was written an edited waaaay back in June of 2009, and was my first real attempt at doing it so I was still playing around with the program. As the episodes go forward, I improved a lot of the looks. Are they on Earth? You will have to read to find out! But thank you for the compliment, I figured it was the best way for aliens to describe our sun by calling it what it is. Alright, I finished season one! And I really want to know what the P.M.P. is in real life, because it looks amazing! Awesome, I hope you enjoyed it! The Pru'tarran Mobile Prison is a Robo Force Fortress of Steele playset from I think 1984. I used it because it was the one playset I had that I was was not owned by any toy companies that would send me cease and desist letters. Ideal toys made it and all the rights for those toys are now in control of Toyfinity toys. Curious, is this Neo Standard Pheyden meant to be part of the growing effort to keep the buildstation stocked, much like the Villser Standard? I really like the look of this figure, and seeing that split chest paint mask from last years anniversary Glyarmor Hybrid come back on a more standard traveler is a welcome surprise! For a neub it's nice to get a crack at some of those 2nd gen founders figures. Also how does this Neo Standard blue compare to the hybrid light Pheyden blue from last years 10th anniversary drop? Should make these drawings into blacklight posters. Been dealing with a lot of unexpected medical expenses but couldn't pass up getting a little of the silver. Great looking stuff all around, hope that awesome new standard pheyden sticks around for a bit so I can pick one up! Here's to another 11 years and then some of you making toys. Matt, thanks for the black Pheyden, black and glow axis sets, and glow phase arms all without paint apps! Got everything I wanted, and the Neo Standard Pheyden was a neat surprise. Would love to see Neo Standard versions of Sarvos, Exellis, Govurom, etc. Some of these guys need some love, Matt! I second that, especially the Exellis and Govurom. So, is the Mechabon going to replace the Gobon? I hope not. I would like both, side-by-side, in the same colors. Doubtful since it's technically still a Toyfinity mold. I had the same fear with Neo Sarvos being produced but we still get the classic. Yeah, you're probably right. I just wish there had been a Gobon in these colors. Is the Silver pretty close to the older metallic silver that the original Gobon and Argen/Infiltrator Buildman used? Pheyden Neo Standard looks amazing. A Xycoss gobon (and phaseons, and gendrone defenders) would be well received in my corner of the universe. Just saying. Amazing drop, congrats on 11 years. Thanks for all your time an effort to make these toys that enhance and inspire our imaginations. I've been stopping by since the 8th anniversary. Thanks for all the work you & yours have done and most definitely all the fun over the last few years with this line. All of the revisits of older figures & secret builds lately along with the solid color restocks now... Could Command Pheyden be coming one day to officially join the line-up? Has my order shipped yet? I never got an email saying it did, but I know better than to trust that after the last drop. Wait, what happened in the last drop?